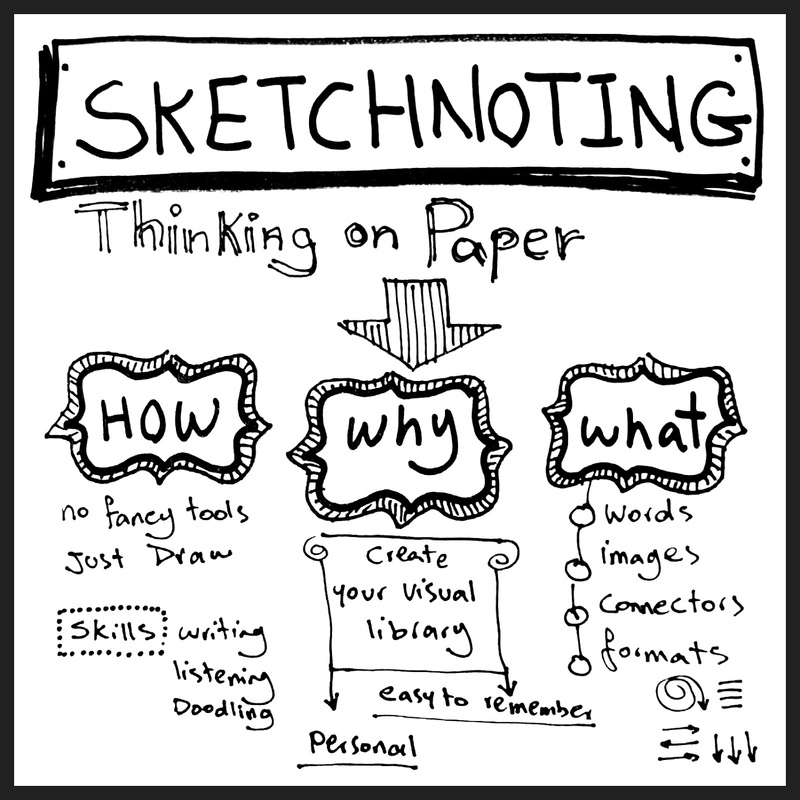 Learning NEXT: Sketchnoting: Purposeful Doodling? At least! Sketchnoting, like some many trends in education, really isn't new. And no, before you pooh-pooh it too quickly, I'm not really talking about doodling though sketchnoting looks a lot like doodling to some. The Guy who started documenting sketchnoting Mike Rohde. Looking at his work might make you feel a bit overwhelmed because this is a guy who draws cool stuff for a living. If you're like me, challenged by stick figures, sketchnoting seems a practice way too complex and difficult. Hmm. Anyone who knows me knows that I reach for a pen or a pencil any time we start kicking around ideas. I might try to draw something if I need to but I'll certainly write down words and phrases so I know that I'm a visual note-taker and a visual thinker. So here's my sketchnote about sketchnoting. 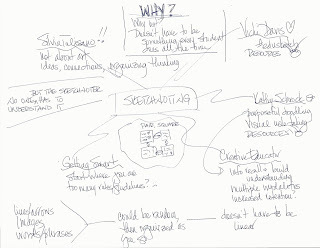 I started with the word "sketchnoting" in the center because I knew I was going to be taking notes from different sites and a concept map format seemed KaffeeKlatsch blog/site. I have a heart next to Vicki Davis's name because I love her work and am so honored to be able to call her "friend." Oh, there's also a head with lines coming up and out from it which is my idea of showing a head exploding: there are so many resources!!!! Yikes! Wait, there's one more because I have a frowny face next to the Getting Smart notes because it felt like there were too many rules and constraints. I can see introducing it to students, but I can't see requiring it. That seems to defeat the value. I saw resources with a library of images. I would get lost if I had to remember the "correct" image for something but then it's also not as creative for me if I have to try to recreate a specific image for a specific concept. I think it would be cool to see how my images evolved as I got more confident and comfortable with whatever I was sketchnoting as well as with sketchnoting. I would say that Silvia Tolisano is the "mom" of sketchnoting. You'll see all kinds of images done by her and by Sylvia Duckworth. Huh. Must be something about the name: Sylvia/Silvia. Anyway, this is Silvia Tolisano's "10 Tips to Get Started." This is a GREAT image although I'd say both she and Sylvia Duckworth are hugely talented and I would not want to play Pictionary against them. But note that Tolisano starts her sketchnote in the upper right hand corner and moves, well, however she wants. She fills up the paper. 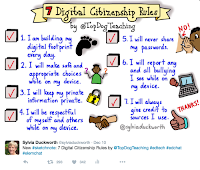 great way to present the rules and share them in a fun way with students as well as parents. The other Silvia's "10 Tips" is a presentation; think poster session. This might be something you'd like to introduce to students as way of taking notes or expanding their note-taking, especially if you use interactive notebooks. But I wouldn't require it and I'd be careful of the rules and constraints. As I noted, Vicki Davis and Kathy Schrock offer more resources than you can process. Your head will explode. 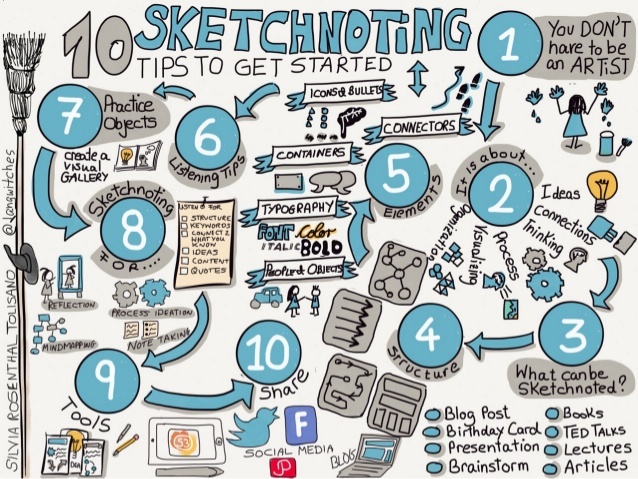 You might start with this post by Andrea Hernandez: Getting Started with Sketchnoting. In fact, this could be a good activity to do with students at the beginning of the school year as a way to get to know them, what they enjoy, what they might like to try or do. Please pay particular attention to points 7 and 8 in her post. If you need more, you might watch this video: My Pencil Made Me Do It: A Beginners Guide To Sketchnoting In The Classroom. If you feel like you need more because the whole idea seems to loosey goosey for you, read Sketchnoting: What is it & how can I get started? This seems to have a few too many conceptual rules for me, but I like the discussion about different layouts. I think the problem with choosing a layout before you start sketchnoting something is that often you don't know what's going to be read or discussed UNLESS you sketchnote after the fact, which is something Ms. Wheeler suggests. 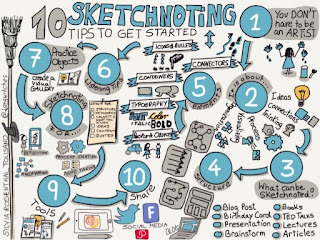 So sketchnoting could be a process for note-taking, for organizing research, or for organizing thoughts and notes graphically. 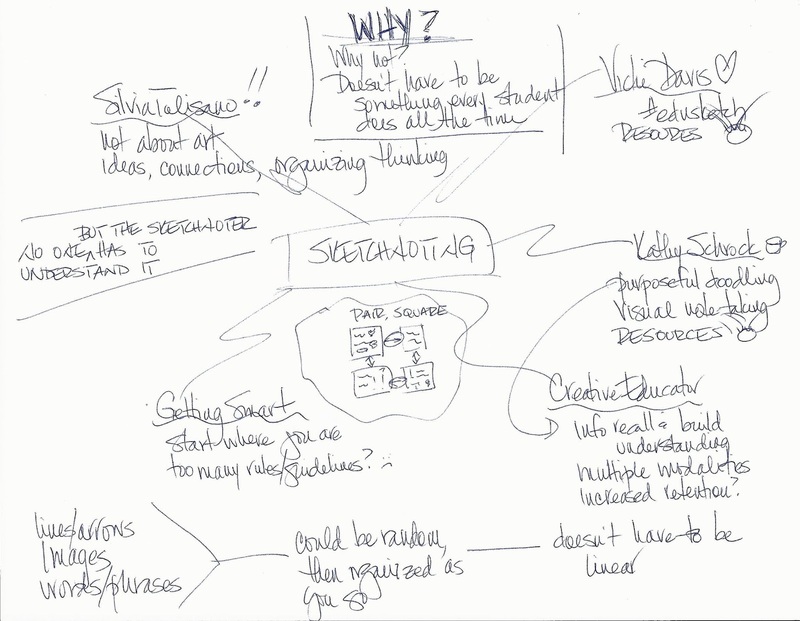 The way Ms. Wheeler presents sketchnoting, it could be a form of assessment. However, you could ask students to summarize their learning in a unit or from a book or whatever, they could sketchnote it. Then when they bring in their work, sketchnote or otherwise, they can share their summaries with others. 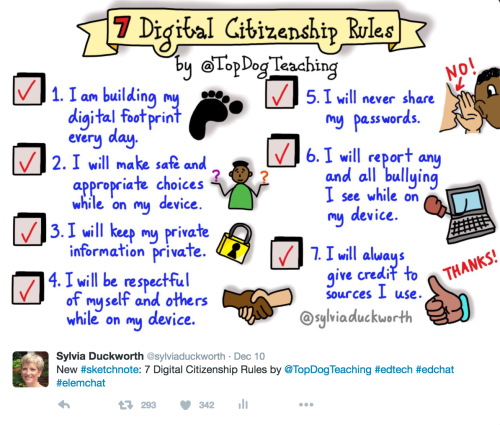 You can well imagine how much fun it could be to try to decipher someone else's sketchnote and what learning could take place that way. You might have noticed the weird image sort of in the center of my sketchnote with the label PAIR, SQUARE. This came to me as I was writing. 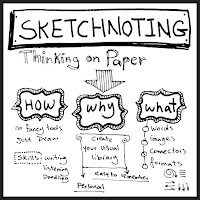 Students summarize a lesson or some readings or whatever and do so with sketchnoting. Students work in pairs to discuss their sketchnotes, maybe even making additions or changes as they talk. Then students square and continue to discuss their sketchnotes. Not only do students see how others think and make notes and organize their thinking, but they get to try to translate each other's thinking and discover what others have noticed in ways they didn't. Ways of noticing. Ways of learning. That's really the purpose of whatever tool or method we ask students to use and to include as part of their own toolkit, right? Maybe sketchnoting will become one of those methods.